Letter to Mrs. A. 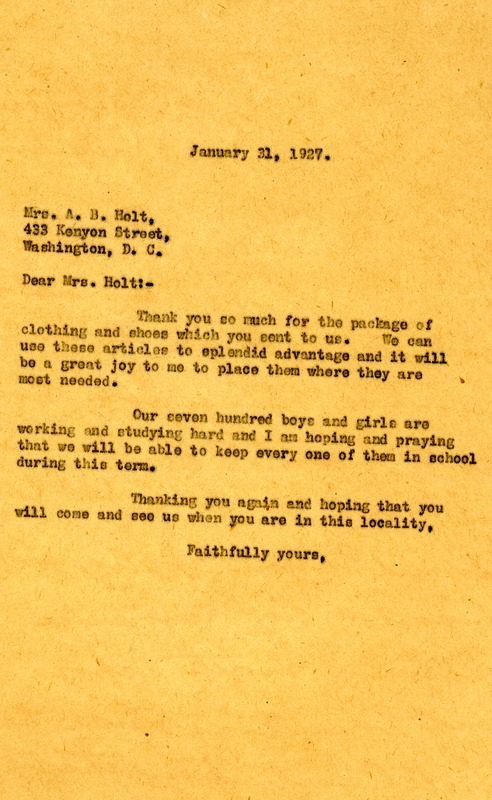 B. Holt from Martha Berry thanking her for the clothes and shoes that she sent to the schools. Miss Berry informs her that the articles were much needed and that she will take joy in distributing them to those who need them. She also informs Mrs. Holt that the seven hundred boys and girls that are attending the schools during the term are working and studying hard and that she hopes that they can all stay at the schools. Miss Berry also invites Mrs. Holt to come and visit when she is in the area and she also thanks her again for her donation. Martha Berry, “Letter to Mrs. A. B. Holt from Martha Berry.” Martha Berry Digital Archive. Eds. Schlitz, Stephanie A., Haley Fortune , et al. Mount Berry: Berry College, 2012. accessed April 22, 2019, https://mbda.berry.edu/items/show/6359.